Elizabethton started its quest for another Appalachian League title on Friday night with a road game. They got a strong start and some youngsters really stepped up their offense in a nice win. They can clinch a spot in the championship series with a win on Saturday (or Sunday, if needed). In addition, Lewis Thorpe and Tyler Wells had strong starts. Alex Kirilloff reached another milestone, but how did the Miracle do in their attempt to get in to the Florida State League playoffs? Keep reading to find out more on the night in the Twins minor league system on Friday, please feel free to discuss and ask questions. The Twins announced that Matt Belisle would be activated from the DL on Saturday. September call ups for Saturday will include: Johnny Field, Chris Gimenez and Tyler Duffey. There had been reports from Rochester that Zack Littell left the field with his duffle bag. It's possible that they just aren't going to activate him until Sunday or something. It appears LHP Andrew Vasquez has been called up as well. He began the 2018 season in Ft. Myers..
Lewis Thorpe made his final minor league start of the 2018 season on Friday night, though he still took the loss. The southpaw from Australia worked the first seven innings. He was charged with three unearned runs on four hits and a walk. He struck out eight. He gave up the three runs in the sixth innings. With one out, Thorpe committed an error, then walked a batter. The big blow was a three-run homer that followed. Ryne Harper worked two scoreless, hitless innings. The Red Wings managed just five hits. Jon Kemmer had two hits. Zander Wiel added a single and a walk. Byron Buxton was 0-for-3 with a strikeout. He was also hit by a pitch. It’s been a terrific season for righty Tyler Wells. He gave up just one run on five hits over 5 2/3 innings. He uncharacteristically walked four, but he (characteristically) struck out eight. Casey Crosby got the final out of the sixth inning and worked a scoreless seventh frame as well. Tyler Jay worked a scoreless eighth inning, and Devin Smeltzer recorded his third save with a perfect ninth. Jimmy Kerrigan led the offense. He went 3-for-4 with his seventh double. Luis Arraez added two singles. Mitchell Kranson singled and walked twice. Luke Raley was 1-for-3 with a walk and drove in two runs. The Miracle came into the season’s final weekend with a 1 1/2 game lead for a playoff spot. On this night, they were unable to help their own cause. Griffin Jax had his first rough start of the season. He gave up six runs (five earned) on eight hits and two walks in just 2 2/3 innings. Kevin Marnon came on and gave up two runs on five hits, a walk and a hit batter over the next two innings. Alex Phillip made his Twins debut and threw 2 1/3 scoreless innings without even giving up a base runner. He struck out two. Adam Bray was charged with two runs on six hits over the final two innings. He struck one out. Royce Lewis went 2-for-4 in the game. Alex Kirilloff went 1-for-1 with three walks. He homered in his first at-bat of the game. It was his 20th overall of the season. He also has 101 RBI. How did Michael Davis last until the 24th round in this year’s draft. All he’s done since signing is mash to the tune of a .308 average with now nine home runs. The biggest came tonight when, down a run in the bottom of the eighth inning, he crushed a grand slam that proved to be the game winner. Gabriel Maciel went 3-for-4. Victor Tademo was 2-for-3 with a walk and his first Midwest League double. Melvi Acosta started. The righty gave up two runs on five hits and a walk in just five innings. He struck out two. Moises Gomez came on and threw two zeroes on the scoreboard. Zach Neff worked both the eighth and ninth frames to be credited with the Win. The E-Twins began their annual playoff run with a game in Kingsport. After the win, Game 2 (and Game 3, if necessary) will be played in Elizabethton. The offense showed up, but it was a terrific start by 2018 pick Josh Winder. The seventh-round pick gave up one run on four hits over the first six innings. He walked none and struck out eight. JT Perez came in for the seventh and got two outs. However, he gave up one run on one hit and three walks. Both outs he recorded came on strikeouts. Jacob Blank got the final seven outs to record the save. Five of the outs came on strikeouts. He gave up one run on one hit and two walks. Yunior Severino and Ricky De La Torre, the youngest players on the team, each had three hits. Severino had a double. Gilberto Celestino went 2-for-4 with a two-run homer. Alex Robles had two hits and drove in three runs. Chris Williams had a single and two walks. 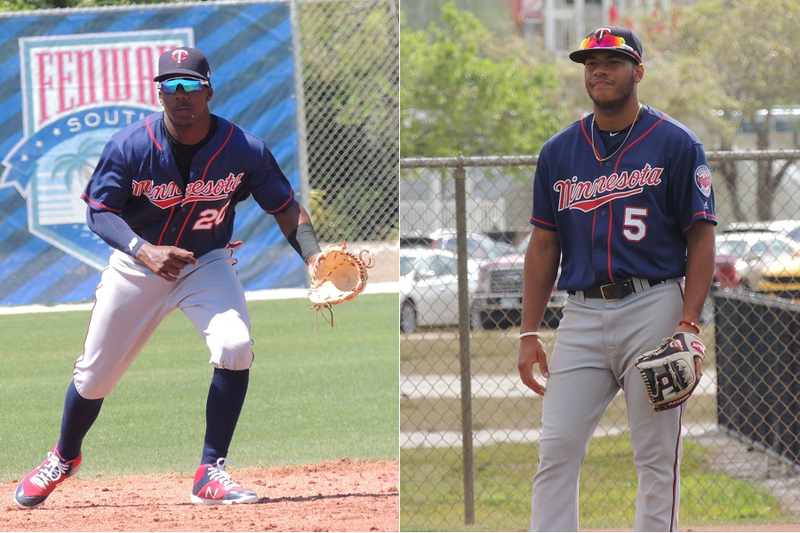 Twins Daily Hitter of the Day: Yunior Severino, Elizabethton Twins (3-5, 2B, 2 R). #5 - Stephen Gonsalves (Minnesota) - 3.2 IP, 6 H, 6 R, 3 ER, 4 BB, 0 K.
Does that mean he's eligible for our post-season roster? For the call-ups tomorrow, I expect Littell, Curtiss and Duffey (mentioned by Molitor), De Jong, and Field to be called up. Buxton's his own debate, Romero should but I have no idea what the plan is there, and Thorpe could too if they want to start his clock. For non-40 man options, I think Nick Anderson deserves a shot. Same with Jake Reed, I like their numbers at AAA. I'll pass on Baxendale and Bard. Gordon and Wade aren't ready yet. EDIT: Andrew Vasquez is getting a call-up. I didn't foresee him arriving quite yet because he's barely pitched in AAA, but he's dominated A+ and AA. That's quite the leap from where he started the season! Johnny Field, Chris Gimenez and Tyler Duffey are being recalled. Andrew Vasquez added to the 40 and called up. Adalberto Mejia to the 60 Day DL. Great pitching performances by Thorpe and Tyler Wells. I think these two will factor into next years team. I would love to see Thorpe get a September call up. I think his body of work has been enough for him to earn a call up. However...he has pitched a career high 129 2/3 innings, this is up substantially from his 83 innings last year. I don’t think the Twins are interested in pushing Lewis any harder this year. To be honest Thorpe could potentially be up as soon as May or June next year as the new FO is much more aggressive in moving prospects (just ask Fernando Romero). Tyler Wells has exceeded any expectations I had of him, especially going into AA ball. I honestly thought he’d be more human in AA, but instead he pitched BETTER. I doubt he’ll be up anytime soon, but he’ll probably be a September call up next year and with his strike out stuff and improving command he could be a bigger piece to the Twins rotation than we could have imagined. I’m sure he’ll be there next year. you only have to be in the organization as of Sep. 1st to be eligible for a postseason roster. DL is fine, as is a non-roster minor league deal (the Cubs just signed Jaime Garcia to one of those). The rules about this are less strict than they used to be. The Vasquatch. Love it. Hope he is good; we need a reliever with that nickname/twitter handle. Would love to see the E-ton middle infield stick together for a long itme. The Miracle are now tied for first with Charlotte, who won their doubleheader by a combined score of 19-0.Should they be tied after the next two games, the first tie breaker is head-to-head competition.I am not real certain when the first and second half split was, but it appears they hold that tie breaker...does anyone know for certain? Will second all the comments about Thorpe, whom I consider one of their two best pitching prospects...along with Graterol.Was great seeing Lewis with a couple hits.Jax hasn't been sharp the last couple games.Having pitched 87 innings after two years of almost no activity, expect he is running on fumes. I also am very excited about the season's Severino and De La Torre had at ETon.They are two more middle infield prospects we are going to have to watch over the coming years. As predicted, Kiriloff has stepped up, even in a loss. (it will take me forever to remember which consonants to double in his name.). As I was just reading an article about the Arizona Fall League, I was thinking he and Lewis could be the Twins' version of Vlad Jr./Bichette next year. When I saw Tademo's line from last night, my knee jerk reaction was to wonder if I should be regarding him as (my words) more than "an interesting, athletic youngster to keep an eye on." Seems like the kind of guy who is the third player in a deadline deal--the really good youngster that nobody has heard about yet, but scouts know is a player. Seems to be doing just fine after jumping over E-ton. Would it be possible to get an end of season summary report on each of the prospects that the Twins received in the trade deadline transactions? I'm old and can't remember who they are. Is Maciel taking CF away from Baddoo? That will be an interesting battle next year - hopefully in Fort Myers for both. Kernels middle infielders Helman (.379) and Davis (.308) are two players to keep an eye on. Each player is 22 years of age. All are performing well. Minnesota Twins traded SS Eduardo Escobar to Arizona Diamondbacks for RF Ernie De La Trinidad, RF Gabriel Maciel and RHP Jhoan Duran. Looking at the stats for the year just now. I gotta think Tyler Wells is the Minor League Starting Pitcher of the Year this year. He has the best ERA,WHIP, and BaBip of all starters in the organization. I'm disappointed that he isn't going to AFL. Maybe it's his innings I suppose. Hope to see him at Major League Camp in March. I think clearly Andrew Vasquez is the relief pitcher of the year. Kid has skyrocketed! Love the underdog! He is a 32nd round guy! A real inspiration to guys who didn't get the draft spot they would've liked. Get in the door and you all have a shot. Even if you don't get the love and press along the way. CONGRATS VASQUATCH! EDIT: Andrew Vasquez is getting a call-up. I didn't foresee him arriving quite yet because he's barely pitched in AAA, but he's dominated A+ and AA. That's quite the leap from where he started the season! [/quote] Hmmm... I couldn’t find Vasquez on the Top Prospects list. He must not be very good. Congrats Andrew! Hmmm... I couldn’t find Vasquez on the Top Prospects list. He must not be very good. Congrats Andrew! I saw him pitch tonight - no argument here. Just kidding. I can't imagine the nerves, especially when things start to go bad. Yay! Building for the future!